Close-up of Botrytis sp. spores. Botrytis sporulating on these infected berries. Note the brown sporulation typical of this fungus. Photo by Jay W. Pscheidt, 1998. Note the tattered leaf due to hail injury, and the water soaked margin of necrotic tissue. Cause This disease is common on the west side of the Cascade Range but a sporadic problem in the arid viticulture regions of the PNW. 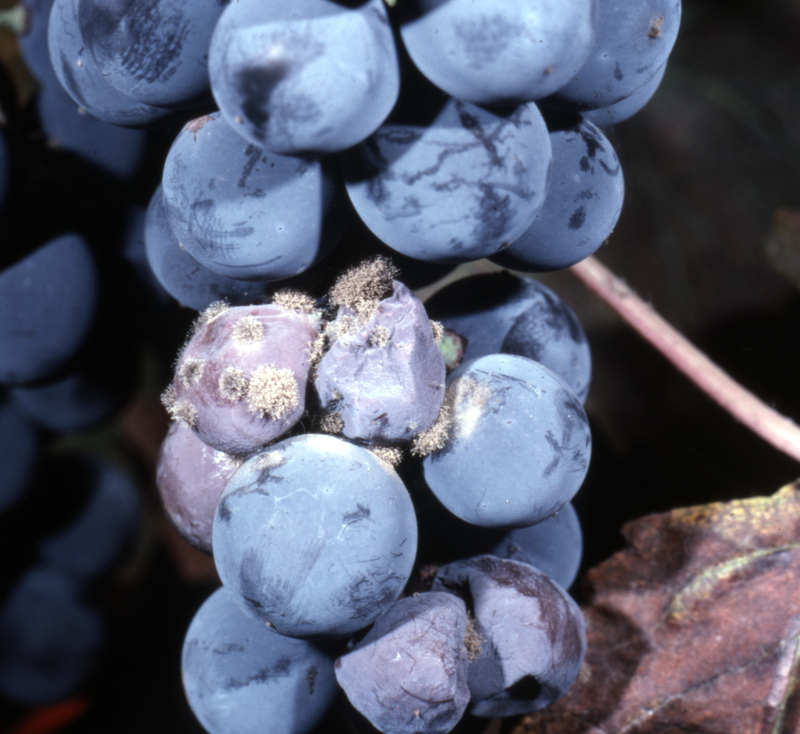 Many fungal and bacterial organisms, of which Botrytis cinerea is the most important, can infect grapes and result in a bunch rot. Botrytis cinerea has a large host range and grows and sporulates on most of them. The fungus overwinters and oversummers as black sclerotia on old cluster stems, canes, and mummified grapes. Spores spread by wind. Young, succulent shoots can be infected in spring, especially if injured by hail. Flower parts frequently are infected and can serve as a source of the fungus within the developing cluster. Inflorescences are susceptible to infection at the start of flowering through fruit set. Wet weather favors infection and disease development, especially near harvest when canopies are dense and berries accumulate sugar. Botrytis cinerea will infect grape berries from 53°F to 86°F with as little as 4 hours of berry wetness. The number of berries infected; however, rises as hours of berry wetness increases. The fungus can quickly spread from berry to berry within ripening bunches and can develop readily on wounded or split berries. Removal of leaves adjacent to clusters aids management of both bunch rot and powdery mildew. The microclimate becomes less favorable for disease development and clusters are covered better with fungicide. 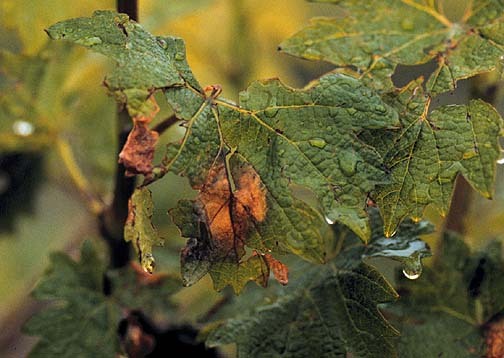 Exact timing of leaf removal will depend on geography and vineyard management. Chance of sunburn increases the later leaves are removed and during extreme heat events. 'Cabernet Sauvignon' is one of the least susceptible wine grape grown in Oregon. 'Gewurtztraminer' is less susceptible than 'Chardonnay', 'Pinot Noir', and 'Riesling'. Bunches that are more tight or compact are at higher risk of the disease. Under certain environmental conditions, white grapes infected solely by B. cinerea may develop a special rot known as noble rot. These grapes can be used to produce a special, very sweet wine. Symptoms Young shoots and leaves may be infected in spring and develop brown, water-soaked areas. These areas generally girdle the shoot, causing it to wilt and die back. The characteristic gray fungal growth may or may not be present. Generally, rotted berries appear in late summer and autumn as small, brown spots on maturing berries. The berry skin may slip off easily when rubbed. Later, characteristic tufts of gray fungal growth appear on the surface of infected berries. Often, rotted berries are near the center of the bunch. The rot then spreads quickly and may encompass most of the bunch. Other organisms may invade the berries later, producing a large variety of colors, smells, and tastes. Occasionally, immature berries may develop a soft brown rot early in summer. Remove leaves adjacent to clusters at fruit set (BBCH 71) to pea-sized (BBCH 75) stage, which also aids in spray penetration and coverage. Removing leaves before BBCH 71 may decrease fruit set and yield, and after BBCH 75 may be ineffective for Botrytis control. Avoid sunburn by removing only the morning-sun side (east or north) of the canopy. Earlier and more leaf removal may be required for vigorous vines with dense canopies. Use an appropriate trellising system to increase aeration and sun exposure. Avoid excessive vegetative growth through rootstock selection and management, irrigation management, and judicious use of nitrogen fertilizer. If adjusting yields by dropping fruit, consider removal of clusters that are in contact with other clusters. Manage powdery mildew as it predisposes berries to infection through the establishment of microscopic wounds on the fruit surface. Select varietal clones with loose cluster architecture. Chemical control Spray during bloom and beginning of fruit set (BBCH 60 to 69), just before berry touch (BBCH 77), start of veraison (BBCH 81), and 3 weeks prior to harvest before rain is expected. Focus more on applications before rain storms rather than at vine growth stage. Fungal strains resistant to site specific chemicals can develop quickly. To delay or prevent building up resistant fungi, tank-mix products from different groups with different modes of action. Also, limit applications from any specific group to two (2) or fewer sprays. Botran 5F at 1.2 quarts/A. Fruit marking can occur on some cultivars when combined with sulfur. Do not use within 14 days of harvest. Low effectivenes. Group 14 fungicide. 14 days reentry. Captan 80 WDG at 2.5 lbs/A. May be applied up to the day of harvest. Do not use with oils, lime, or alkaline materials. Contact your grape buyer before application, as several wineries and/or countries may not allow its use. Moderate effectiveness. Group M4 fungicide. 48-hr reentry. Elevate 50 WDG at 1 lb/A. Can be used up to and including the day of harvest. Good control. Group 17 fungicide. 12-hr reentry. Endura at 8 oz/A. Do not use within 14 days of harvest. Do not use for bunch rot management if you use Pristine for powdery mildew. Group 7 fungicide. 12-hr reentry. Fracture (BLAD) at 24.4 to 36.6 fl oz/A. Reapply if rain occurs within 12 hours of original application. Do not use within one day of harvest. Group BM01 fungicide. 4-hr reentry. Intuity at 6 fl oz/A. Do not use within 10 days of harvest. Group 11 fungicide. 12-hr reentry. Iprodione-based products. Do not apply within 7 days of harvest for wine grapes. Good control when resistance is not a problem. Group 2 fungicides. 48-hr reentry. Iprodione 4L AG at 1.5 to 2 pint/A. Meteor at 1.5 to 2 pint/A. Nevado 4F at 1.5 to 2 pint/A. Rovral 4 Flowable at 1.5 to 2 pint/A. Kenja 400 SC at 20 to 22 fl oz/A. Do not use within 14 days of harvest. Group 7 fungicide. 12-hr reentry. Mancozeb products such as Dithane, Manzate Pro-Stick, or Penncozeb at 1.5 to 2.5 lb/A. Do not use within 66 days of harvest. It is registered but considered ineffective. Group M3 fungicides. 24-hr reentry. Oso SC at 3.75 to 13 fl oz/A. Do not use within 7 days of harvest. Fair to good in effectiveness. Group 19 fungicide. 4-hr reentry. Ph-D WDG at 6.2 oz/A. May be applied on the day of harvest. Fair to good in effectiveness. Group 19 fungicide. 4-hr reentry. Scala SC at 18 fl oz/A alone or 9 to 18 fl oz/A in a tank-mix. Do not apply within 7 days of harvest. Good control. Group 9 fungicide. 12-hr reentry. Topsin M WSB at 1 to 1.5 lb/A plus another fungicide. Do not use within 14 days of harvest. 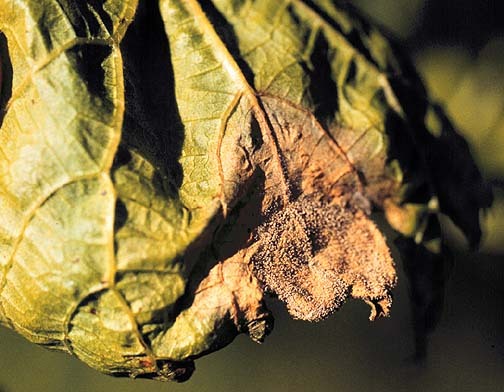 Resistant fungi, which make this product ineffective, are widespread in the Willamette Valley of Oregon. Group 1 fungicide. 2-day reentry. Vangard 75 WG at 10 oz/A when used alone or at 5 to 10 oz/A when tank-mixing with another fungicide. Buffer to a pH of 5 to 7 when tank-mixing with Rovral. Do not use within 7 days of harvest. More effective at cooler temperatures. Good effectiveness rating when used alone. Group 9 fungicide. 12-hr reentry. Ziram 76 DF at 3 to 4 lb/A. Do not use within 10 days of harvest. Effectiveness is considered low. Group M3 fungicide. 48-hr reentry. Inspire Super at 16 to 20 fl oz/A. Do not use for bunch rot control if it was used for powdery mildew. Do not use within 14 days of harvest or on 'Concord'. Group 3 + 9 fungicide. 12-hr reentry. Luna Experience at 8 to 8.6 fl oz/A. Do not use for bunch rot control if already used for powdery mildew control. Do not use on 'Concord' or within 14 days of harvest. Group 3 + 7 fungicide. 12-hr to 5-day reentry depending on activity. Luna Sensation at 5 to 7.6 fl oz/A. Do not use for bunch rot control if already used for powdery mildew control. Do not use on 'Concord' or within 14 days of harvest. Group 7 + 11 fungicide. 12-hr reentry. Miravis Prime at 10.3 to 13.4 fl oz/A. Do not use for bunch rot control if already used for powdery mildew control. Do not use within 14 days of harvest. Group 7 + 12 fungicide. 12-hr reentry. Pristine can be used at 18.5 to 23 oz/A. Do not use within 14 days of harvest. Do not use on labrusca type grapes such as 'Concord' due to possible foliar injury. Do not use for bunch rot control if it was used for powdery mildew. Group 7 + 11 fungicide. 12-hr or 5-day reentry based on activity. Switch 62.5 WG at 11 to 14 oz/A. Do not use with an adjuvant or within 7 days of harvest. Good control. Group 9 + 12 fungicide. 12-hr reentry. Notes Some registered products offer only suppression of this disease and thus are not recommended for use. These products include Abound, Mettle, Quadris Top, Sovran, Tebucon, Topguard EQ, Unicorn, and Willwood Azoxy. Although Gavel is registered, it contains a chemical for control of downy mildew, a disease not found on grape in the PNW and thus is not recommended for use. Forecasting A forecasting program has been developed that assigns a medium bunch rot risk at 60°F with 15 hours of berry wetness but a high risk if berries have been wet 17.5 hours. Fungicides are to be applied after a medium risk occurs during the growing season. This program has not been evaluated in the Pacific Northwest. Biological control Many different organisms have been shown to be effective under controlled conditions. Sometimes they can be shown to be effective in the vineyard under low to moderate disease pressure. Combine with cultural tactics, such as leaf removal, or integrate with synthetic fungicides for best effectiveness. Growth Regulation A single application will help elongate the rachis for a more open clusters, better air circulation and pesticide coverage. Yield reduction may occur! References Ciliberti, N., Fermaud, M., Languasco, L., and Rossi, V. 2015. Influence of Fungal Strain, Temperature, and Wetness Duration on Infection of Grapevine Inflorescences and Young Berry Clusters by Botrytis cinerea. Phytopathology, 105:325-333. Elmer, P.A.G. and Reglinski, T. 2006. Biosuppression of Botrytis cinerea in grapes. Plant Pathology 55:155-177. Hed, B., Ngugi, H.K., and Travis, J.W. 2011. Use of gibberellic acid for management of bunch rot on Chardonnay and Vignoles grape. Plant Dis. 95:269-278.